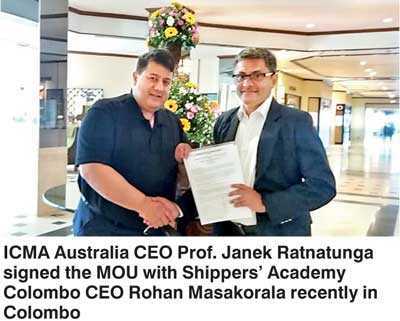 Shippers’ Academy Colombo (SAC) and CMA Australia have joined hands for capacity building and certification in international trade and logistics. Shippers’ Academy Colombo (SAC) which was established in 2011 with two years’ assistance from Singapore Shippers’ Academy has now completed eight years and has been conducting numerous training programs and coming up with novel ideas for education and to promote Sri Lanka’s International trade services, logistics and maritime industry. In addition to certificate level capacity building and training, it introduced and pioneered logistics and trade quizzes including the Governor’s Challenge Trophy with CBSL and ExImQuiz with EDB and Terminal Operators’ Cup with SLPA. This innovation led to many others to follow the same, Shippers’ Academy Colombo took the lead role in establishing the Colombo International Maritime Conference (CIMC) and has organised Sri Lanka’s biggest conferences in history where over 450 delegates attend with over 60 speakers from around the world taking part in 2015 and 2016. SAC is now building the Sri Lanka Logistics brand to take to the world as well. Commenting on activities of the Shippers’ Academy Colombo, CEO Rohan Masakorala said that now they have embarked to market Sri Lanka beyond its shores and is the founding partner of South Asia Maritime and Logistics Forum where they give opportunities to international audiences to understand Sri Lanka by doing promotions overseas with their counterpart in India Gateway Media, they are having the second such event in Dhaka Bangladesh this week and had the first event in India in 2017. Prof. Janek Ratnatunga, formally from Monash University heads CMA Australia and has wide experience on many fields. Commenting on the MOU he said that Shippers’ Academy Colombo has got international flavour, but the important things in it is a home-grown model that suits local demand, many people promote global brands only as representatives, but when you advance you create your own value proposition, identity with partnerships. This has to be the way forward and that is why we decided to join this home-grown initiative and support it. Students now following Shippers’ Academy Colombo certification can apply for CMA certification upon completion of the syllabus agreed upon with CMA Australia.